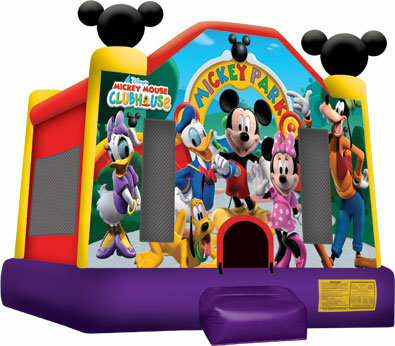 The licensed Mickey Park large jump will inject your next party or event with a little club house fun, as Mickey and his pals invite everyone to the Mickey Mouse Club House! A pair of trademark, three-dimensional Mickey ears helps show the way, and sharp, colorful artwork make participants feel they're at Disney! This jumper features Mickey, Minnie, Daffy, Daisy, Goofy and the Mickey Mouse's faithful pup, Pluto, perfect friends for kids to jump alongside all day! This active, licensed, large Mickey Park jumper. The bounce house is the perfect way to combine fun and healthy activity, With a variety of colors, shapes and themes, our moonwalks offer kids of all ages exciting aerobic activity. This jumper has 360-degree mesh windows, so parents and spectators can have a clear view of all the fun. Our moonwalks are made safe and secure with lite n strong™, fire-resistant vinyl making it safer and more durable.